Our world-renowned Glacier Heli Hike is the NZ Must Do not to be missed. Up to three hours spent on the ice hiking the glacier and exploring features. * Peak pricing $499 per person applies Jan-Mar 2019. Off peak pricing $479 per person applies April-Sept 2019. Prices valid until 30th September 2019 and subject to change. My favourite thing about the glacier is how much it moves, each trip really is different because it is constantly changing. Keeps it interesting! " A reasonable level of fitness and agility is required. The glacier terrain is variable and reasonably challenging. We provide you with all the gear you need to walk on the ice including boots, crampons and trekking poles, and your guide carries an ice pick so they can maintain your path as your trip progresses. You will, however, need to be agile enough to navigate the glacier features and fit enough to hike for a three hour period. While the route changes from one day to the next, you can expect to be on the ice for around three hours, walking for much of that time but with frequent stops to explore the features, hear some stories and information and of course make the most of photo opportunities. There will usually be some uphill components of the hike route but these are generally short bursts rather than long climbs. 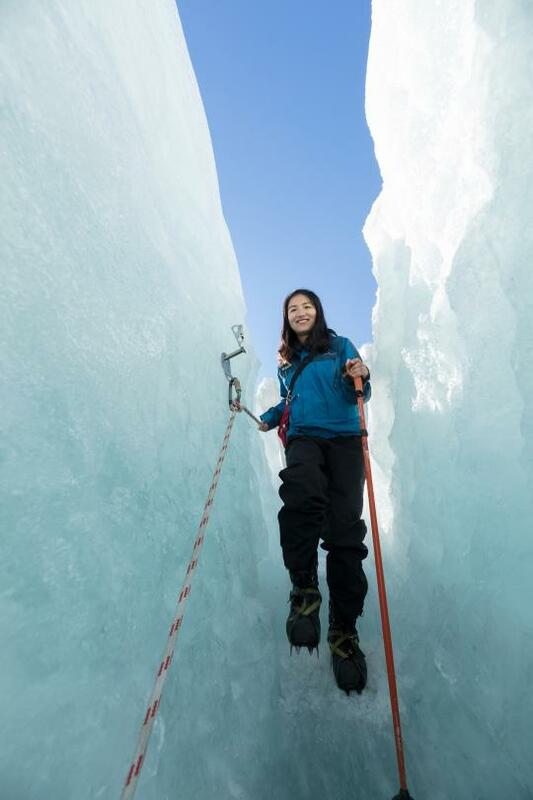 There are also various glacier features to navigate including crevasses and narrow paths. A reasonable level of fitness and agility is therefore required to negotiate this type of terrain, but if you're comfortable with walking for two to three hours then you will most likely be capable of completing our Glacier Heli Hike trip. Get the most out of your Glacier Heli Hike. We want all of our guests to have the best possible time on our Heli Hike experience. We provide all the gear and equipment you need to stay warm, dry and safe while exploring the ice and ask that you come prepared with suitable clothing and accessories that will keep you comfortable as well. Thinking of heading to the Hot Pools after your trip? Remember to bring your swimming gear with you, you can store your belongings in our lockers for $2. Towel hire is also available for $5 at reception. Great experience and very unique! Great guide and very well taken care of. Knowledgeable and enthusiastic staff on a world class site, what's not to love? The scenery is breathtaking and the experience completely worth the money. The guide ensures your safety and makes you feel looked after. Your glacier trip includes access to the Franz Josef Glacier Hot Pools. What better way to relax after a day in the valley than in the rejuvenating warmth of our hot pools? Your experience with us would not be complete without spending some time reflecting on your adventure in the relaxing surroundings of the Franz Josef Glacier Hot Pools. 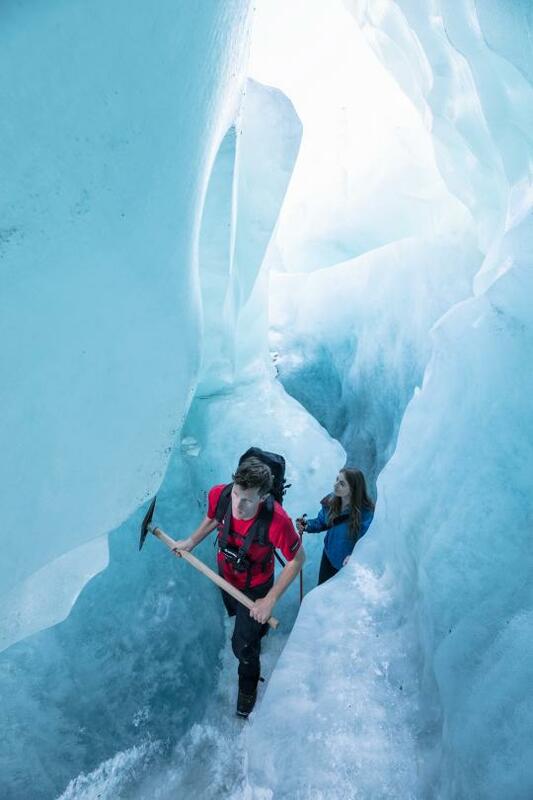 Entry to the main pools is complimentary with your Franz Josef Glacier Guides experience, and access to the pools is through the same reception area that you check in for your Glacier Guides experience. The hot pools are intimately nestled in the lush surrounds of native rainforest and offer three main pools of varying temperatures in which to unwind. As well the three main pools, our facility also offers three private pools available to Franz Josef Glacier Guides' guests for the exclusive upgrade rate of $41. Our spa and massage facilities are just the thing for aching muscles; treat yourself to a relaxing massage from one of our therapists or an uplifting facial treatment. The perfect end to an unforgettable day. We adhere to the highest safety standards to ensure ongoing safety for both our guests and our team. If you have any doubt about your ability to participate in the trip we recommend you consult your medical practitioner prior to booking. In addition to this, our lead guides may need to restrict guest participation on a Heli Hike Trip based on the specific conditions of the glacier on the day. The changeable weather that shapes our dramatic landscape on the West Coast can also impact our ability to operate. We will not compromise the safety of our guests or staff in any circumstance, so if the weather conditions mean it's not safe to operate a trip we will cancel it. All trips cancelled due to weather will be refunded. We need a four-hour window of clear weather to operate our Heli Hike, and because the weather is so changeable we are constantly monitoring weather reports and conditions on the glacier to make the safest and most accurate decision. We want to give you the very best chance of getting on your trip as possible, therefore, we make the final call as to whether a trip is going ahead on the morning of your scheduled trip departure. If your trip is cancelled we will notify you by email. You’re welcome to come in and chat to our friendly team for an update on weather conditions, to reschedule your trip or arrange your refund. If you can manage it, we recommend spending at least two days in the Franz Josef region to allow the best chance of getting onto a Heli Hike trip.